A GFCI is a ground fault circuit interrupter. A ground fault circuit interrupter is an inexpensive electrical device that, if installed in household branch circuits, could prevent over two-thirds of the approximately 300 electrocutions still occurring each year in and around the home. Installation of the device could also prevent thousands of burn and electric shock injuries each year. An unintentional electric path between a source of current and a grounded surface is referred to as a ground-fault . Ground faults ground-fault. Ground faults occur when current is leaking somewhere, in effect, electricity is escaping to the ground. How it leaks is very important. If your body provides a path to the ground for this leakage, you could be injured, burned, severely shocked, or electrocuted. A three-year-old Kansas girl was electrocuted when she touched a faulty countertop. Here's how it may work in your house. Suppose a bare wire inside an appliance touches the metal case. The case is then charged with electricity. 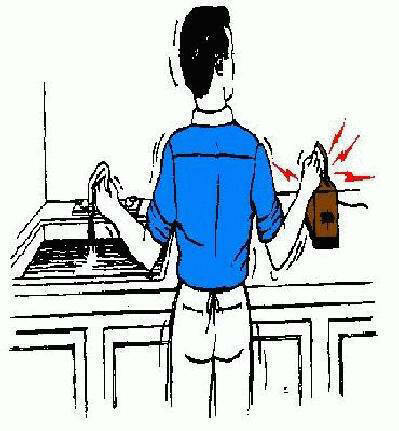 If you touch the appliance with one hand while the other hand is touching a grounded metal object, like a water faucet, you will receive a shock. If the appliance is plugged into an outlet protected by a GFCI, the power will be shut off before a fatal shock would occur. 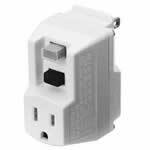 This type of GFCI is used in place of the standard duplex receptacle found throughout the house. It fits into the standard electrical box and protects you against ground faults whenever an electrical product is plugged into the outlet. Most receptacle-type GFCls can be installed so that they also protect other electrical outlets further down stream in the branch circuit. In homes equipped with circuit breakers rather than fuses, a circuit breaker GFCI may be installed in a panel box to give protection to selected circuits The circuit breaker GFCI serves a dual purpose - not only will it shut off electricity in the event of a ground-fault , but it will also trip when a short circuit or an over-load occurs. Protection covers the wiring and each outlet, lighting fixture, heater, etc served by the branch circuit protected by the GFCI in the panel box. Where permanent GFCls are not practical, portable GFCls may be used. One type contains the GFCI circuitry in a plastic enclosure with plug blades in the back and receptacle slots in the front, as shown in Figure 4. It can be plugged into a receptacle, then, the electrical product is plugged into the GFCI. Another type of portable GFCI is an extension cord combined with a GFCI, as shown in Figure 3. It adds flexibility in using receptacles that are not protected by GFCls. 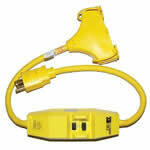 Note: Many of the portable GFCI devices also have built-in surge protection. To test the receptacle GFCI, first plug a nightlight or lamp into the outlet. The light should be on Then, press the TEST button on the GFCI. The GFCI's RESET button should pop out, and the light should go out. If the RESET button pops out but the light does not go out, the GFCI has been improperly wired. Contact an electrician to correct the wiring errors. If the RESET button does not pop out, the GFC1 is defective and should be replaced. If the GFCI is functioning properly, and the lamp goes out, press the RESET button to restore power to the outlet.